Cruise liner announces first purpose built luxury cruise vessel to put the top of the world on its itinerary. French luxury expedition operator Ponant has signed contract with Vard Søviknes yard in Norway to build the world’s first non-nuclear cruise ship to sail to the geographic North Pole. To be named “Ponant Icebreaker”, the ship is also the first cruise vessel with PC 2 ice class. The vessel, developed by Aker Arctic in Finland and Stirling Design International, will also be the first electric-hybrid cruise ship in the world powered with liquid natural gas (LNG), press releases by Aker Arctic and Stirling Design read. Like Hurtigruten’s new cruise vessels “Roald Amundsen” and “Fridtjof Nansen”, Ponant’s new ship will feature batteries, but takes the environmental image one step further than Hurtigruten by running the propulsion on LNG. Today, only Russian nuclear powered icebreakers sail to the North Pole with tourists, two or three voyages each season out from Murmansk. The icebreakers, however, are not built purposely for tourism, as their main objective is to break the ice for other ships along Russia’s Northern Sea Route north of Siberia. North Pole cruises just add some extra income for the Russian icebreaker fleet in the summer season. Vard writes in its press release that the contract value is approximately 2,7 billion Norwegian kroner (€274 million). “Ponant Icebreaker” will be 30,000 gross tons, about 150 meters long and have 175 cabins to accommodate 270 passengers in addition to a crew of 180. And yes, if you were wondering, the ship will carry two helicopters and a dozen zodias for exploring and landings at sites with no harbor facilities. 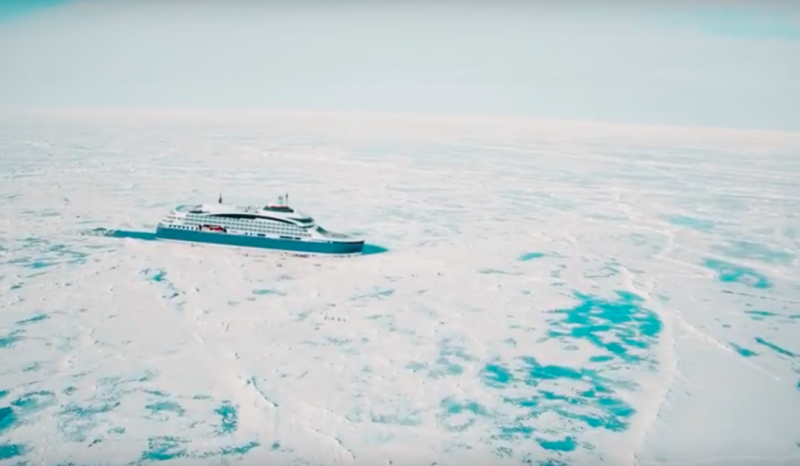 “Ponant Icebreaker” markets the new ship’s voyages with “Be one of few to reach 90 degrees latitude - the North Pole.” Screenshot from Ponant’s video. The new cruise vessels just add to the long list of new ice-classed expedition cruise vessels aimed for Arctic waters. Ponant has already four other vessels under construction and market itself, like several other cruise liners, as number one for polar cruises. It might seems like a paradox, but global warming opens more and more Arctic waters for vessels with tourists who want to see the sea ice before it vanish. Interviewed by the Barents Observer at Iceland last October, CEO of Lindblad Expeditions, Sven-Olof Lindblad said mass tourism will come to the Arctic. «Tourists are coming in a big wave. Companies follow each other,» he said. Lindblad Expeditions was in 1969 the first company to get a purpose-built vessel for cruising the waters of the Arctic and Antarctic. Additional to Ponant and Hurtigruten, several other cruise liners are currently building expedition cruise ships with Polar Class 6 hulls. An overview made by the Barents Observer last spring showed at least 16 such ships to take to the Arctic Seas within the next few years.